Anyone who has struggled with weight loss knows how seductive “fat burning” products can be. They claim to help you shed pounds without changing your eating habits or exercising. 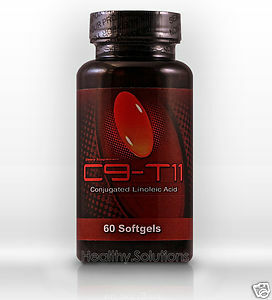 C9-T11 Fat Burner is one such product that claims to offer fat burning properties. It also claims to build muscles. Does it work? Some say yes, but it might not offer the lasting results you desire. Find out all you need to know about C9-T11. These letters and numbers are an abbreviation for the “Cis-9 Trans-11” isomer of conjugated linoleic acid (CLA). It is considered a natural, safe anabolic compound that promotes muscle building. It does so by targeting the body’s production of prostaglandins. In addition to muscle growth, some also believe it increases strength and burns fat. There is also research showing C9-T11 reduces bad cholesterol and triglycerides, as well as blood sugar, but the reviews of its effectiveness are mixed. Does C9-T11 Work for Weight Loss? Some studies have shown CLA to be an effective weight loss supplement. One such study, published in the American Journal of Nutrition, claimed study participants given CLA had significantly lowered their body fat mass. Those participating in the study were all healthy adults, aside from being overweight, and they reported little to no side effects from using CLA. However, another study published in the American Journal of Nutrition included 100 test subjects who had lost 8% of their body weight using CLA. Unfortunately, the fat burning effects of CLA did not last and many regained the weight they had lost while taking CLA. Like many weight loss supplements, users were only able to maintain their weight loss for as long as they used the product. Once they stop taking the weight loss product, their bodies lose the artificial support and return to functioning as before. This is especially true if eating and exercise habits were not altered. In addition to the controversy over its performance-enhancing qualities, there are also people who criticize its ability to actually help people achieve weight loss. Despite the studies that have shown CLA is capable of burning body fat, many believe it is not enough to actually prove that it works as a reliable weight loss product. There might also be evidence that is raises blood sugar levels instead of lowering them. This was the case for some diabetic users. There is also growing evidence that CLA might damage cardiovascular health and could increase a woman’s risk for breast cancer. These risks are enough to prevent some people from using CLA, even if it would help them lose weight. Other criticisms include the fact that CLA users might have adverse reactions if they are not strength training during their weight loss. Without a weight lifting regimen, CLA might actually cause users to gain weight. There is some concern that CLA might be dangerous for nursing mothers. Even the most fit women in the world struggle with weight loss after pregnancy. Weight loss products can seem very appealing after giving birth, when a person is trying to shed the last of her pregnancy pounds. These products need to be used with extreme caution when a woman is nursing. There is evidence CLA reduces the fat content in breast milk, which is a newborns sole source of nutrition. The product is sold in 1,000 mg soft gel capsules and the recommended daily dosage is at least three capsules per day. Unfortunately, it can be difficult to determine exactly how much CLA is in each capsule or in a dosage, so you will need to use it for awhile to determine the dosage that is right for you. The website selling C9-T11 promises their product is 100% safe and effective. Unfortunately, there is no inclusion of an ingredients list. Users are unable to tell how the product is made or if it includes any inactive ingredients. Based on this lack of information and based on the skepticism over the results and safety of CLA in general, it is better to consult your doctor before using this or any other muscle building products. Everyone’s body is different and each weight loss and health situation is different. For some, weight loss supplements are effective and provide the boost needed to enjoy successful, long-term weight loss. However, there are also risks involved and you need to be sure you are not putting your body in danger, especially if you are guaranteed only limited results.